Sunny Mother Nature says if you want to help Mother Nature, use curtains instead of blinds! I love curtains. I think the idea of pushing back floor length curtains to reveal the sunlight in the morning is just awesome. Yes, it does bring to mind Victorian times, or medieval times, but I’m ok with that. My problem with blinds, compared to curtains is this~ blinds are much more difficult to clean, or dust compared to curtains. All you have to do with curtains is just put them in the washer on delicate/gentle cycle, and then for one minute in the dryer, and hang them back up. With blinds? They collect the dust as well as dirt in your home. If you want them to actually get clean, you have to scrub them~not so easy. Also, have you ever noticed how much quicker blinds wear out compared to curtains? Curtains last for years! Yet, blinds will start to bend and they will stop “opening” so your only option is to just pull them open, or vice versa. Even the individual blinds will begin to go different directions…I mean the list could go on forever! Not only that, but the fabric of curtains, even if you’re done using them as curtains, could be used for something else. With blinds? They just go straight to the landfill~there’s no real way to really reuse them. But overall, I think blinds just do not look as beautiful as if there are curtains on the windows. Curtains bring an atmosphere with them to a room that blinds just lack. So, use curtains, not blinds! Mother Nature will love you for it, and your windows will add to the design of your room, not take away. Go out, live greener, live sunnier, and have a sunny day! Try to avoid “fragrance” or “parfum” in the list of ingredients on your body washes, lotions, perfumes, face washes, body mists, even sometimes laundry detergents, etc.! I touched on this topic in my earlier post Sunny Mother Nature Loves Castile Liquid Soap. The idea that the FDA does not require companies to tell you what exactly they’re placing in their products under the “fragrance” label. If you have an allergic reaction? Too bad, you’ll never know what the exact ingredient it was you had a reaction too. Good luck avoiding hundreds of ingredients you don’t even know of. Not only that, but they could be harmful ingredients, like parabens, carcinogens, etc. and we won’t know. It really is a scary thought to think about. How many of those unknown ingredients are really good for us, or for Mother Nature? I’m betting that if they were “good” ingredients, like argan oil, aloe vera, fruit extracts, etc. they wouldn’t be putting them under “fragrance”~ they would be using them in their ads and advertising them to push sales! So, what to do? It is a simple idea, but possibly difficult to follow~ Don’t buy any product that has “fragrance” or “parfum” in their ingredient listing! This requires every one of us looking at those labels every time we buy something. I’ll admit that there are times where I forget to and after buying a product, I’ll look at its ingredients. Sadly, I’ll more often than not see “fragrance” along with all those other unpronounceable words. I think partly the companies like using fragrance as a listing to fool us into thinking that because it’s the fragrance, then that must be an okay ingredient, when really it may not be so “okay,” or even safe for us. When products have a fragrance, it’s ok, as long as those products list all of their ingredients. To make this easier, go for natural products~most of the time they openly tell you every ingredient that is in their products. However, be careful~ Even some natural companies state “fragrance” on their ingredient lists! I believe that if a company does truly care about their consumers’ health, then they will list all of their ingredients. If they do not list ALL of their ingredients, then just walk away from that company. Our health is worth it! So, read those ingredients and try to avoid “fragrance” in your products! Mother Nature will love you a little more even if you just try to avoid “fragrance.” After all, any ingredients that aren’t good for you, aren’t good for Mother Nature either! So, go out and live a little greener and live a little sunnier! Sunny Mother Nature says purple is perfect for Romantics! Although it’s still the middle of January, it seems that many, including myself, are looking towards Valentine’s Day to get them through the snowy, winter season. I absolutely love pink! But, I love purple just as much! And with Valentine’s nearing, people always automatically think they must wear either red, or pink to look romantic. But, hold on there! If you want to wear something beautiful and romantic on Valentine’s Day, don’t feel you need to wear red or pink. Instead, wear purple! Purple is romantic, beautiful and feminine. It’s a wonderful color for Valentine’s Day instead of the usual red and pink. Or, for anytime when you want to feel and look amazing! All such pretty purple items! And all are perfect for Romantics on Valentine’s Day, or any day you feel romantic! So, try wearing purple this Valentine’s Day! Mother Nature agrees that it’s a beautiful romantic twist to the expected Valentine’s reds and pinks we’ll be seeing. Please Note: I am not affiliated, nor do I know any of the Etsy shops I featured here, or in my treasury. They just have beautiful items. Sunny Mother Nature Says Create! 17 Jan 2011 Comments Off on Sunny Mother Nature Says Create! Sunny Mother Nature says try to create something, or at least work on something creative, at least once a week! It is often times difficult to find time in our busy lives to create, especially to create on a regular basis. Yet, by creating you will be focusing your energy on something positive~resulting in lower stress levels! ~carve something out of wood, stone, etc. Your mind is the only thing limiting you on what you could create! Just try to work on something creative at least once a week. You’ll feel less stressed. You’ll even feel sunnier and a little bit happier (along with Mother Nature) every time you finish a piece! Sunny Mother Nature Loves Flower Headbands! Sunny Mother Nature just loves flower headbands! I’ve liked this trend, but it wasn’t until very recently that I fell in love with it. It is so easy to add a cute headband, especially one with an adorable flower, and just instantly look more pulled together and on trend! 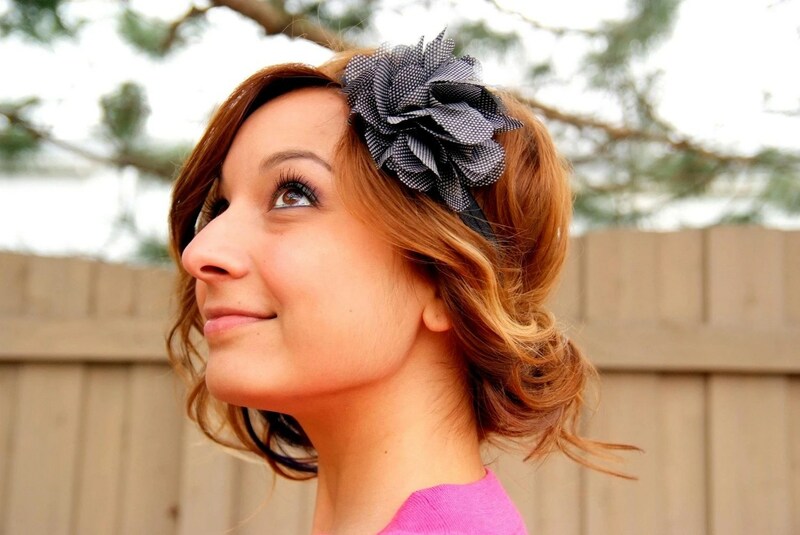 So many colors look awesome as flowers on headbands, but my personal favorites are black, hot pink, and dark purple! 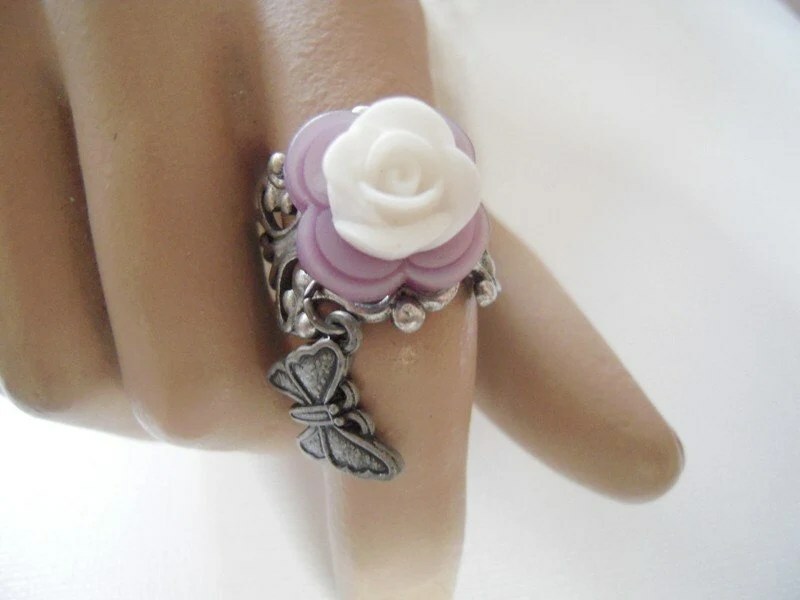 Like this one from milarosedesigns on www.etsy.com. It is a black with white polka dots flower on a headband! It is so pretty, and so quick to add to any outfit. 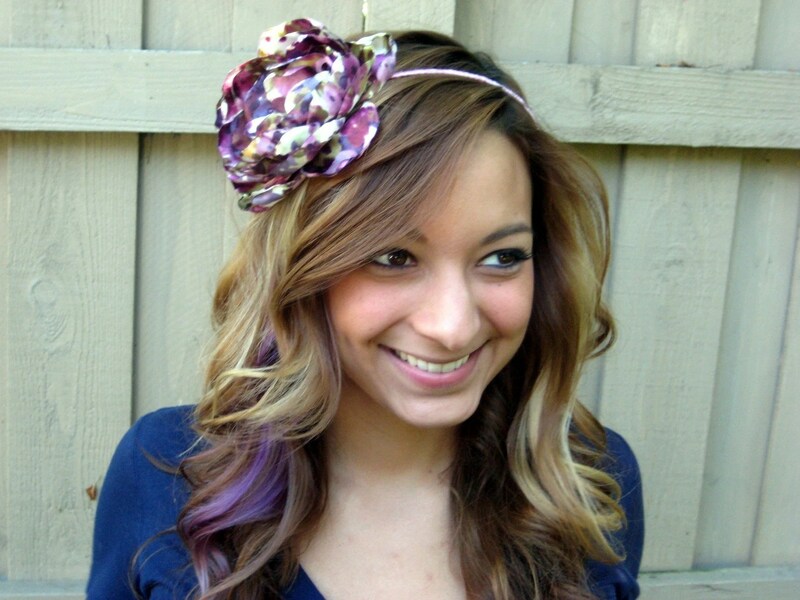 So, go grab a flower headband you already have, or buy one and start rocking an awesome headband! And Mother Nature won’t mind if you splurge on one if it means it’ll make your day, and the day of others around you, more sunny! Please Note- I am not affiliated with milarosedesigns on www.etsy.com. I just love their headbands! Relax and have a cup of Tropical Island Getaway tea with Sunny Mother Nature! I know it is winter, but I cannot get the beach off my brain. So to help, I’m drinking Tropical Island Getaway tea, a blend you can only get from Compass Teas. It is a caffeine free green rooibos blend. It has peach, mango and papaya bits in it. This makes it a fruity rooibos tea, to help you feel like you’re at the beach, even if you’re miles away from the nearest one (like me). Rooibos is another tea that can be found in two types-green and red. Both kinds can help aid in digestion. Tropical Island Getaway tea is $7.00 for 3 oz, which makes about 40 cups of tea! Please Note- I am affiliated with Compass Tea Company, www.compassteas.com. The price and ounces listed here were correct at the time I posted them. They may change without my knowledge. It’s easy to tell if a tea has caffeine, or if it’s naturally caffeine free with Sunny Mother Nature! There are people who only want caffeine. Others who only want caffeine free. And then there are people like me who drink both. 1) If the tea is from the Camellia sinensis plant, then it has caffeine. You’re probably wondering how science class suddenly came into a tea post, right? Well, that’s the only science, I promise! 2) If it is a white, green, oolong, or black tea-then it has caffeine. 3) If it is a red tea, aka rooibos, or honeybush tea, then it is caffeine free. Basically, remember that red tea is NOT from the Camellia sinensis plant, and you’re good. 4) If it is an herbal tea, then it is caffeine free. Any herbal teas, like spearmint, lemongrass, peppermint, etc. and tea blends that only have herbs in them, like a spearmint and peppermint blend-are caffeine free. 5) If a tea blend has some herbs, like peppermint and spearmint, mixed with any white, green, oolong, or black tea, then it is NOT caffeine free. Remember that if a tea blend contains even one tea that has caffeine, then the entire tea blend is considered caffeinated. That’s it! Those are the 5 things to look for to know whether a tea has caffeine, or is naturally caffeine free! So, go drink a cup of tea- caffeinated, or caffeine free- your choice! Mother Nature will love that you are drinking something that is natural and has so many health benefits in it too!